It is 82 minutes in, the score is 0-0, and I am doing a Klopp. I am screaming at my players to get forward, to take advantage of the knackered opposition, and to play the ball into wide areas to allow our fastest and most audacious players to cut inside and make magic happen. But it seems they are incapable of doing this given that Rafa Benitez’s Newcastle United have dropped deep looking for the point, leaving few gaps to exploit. Pick up a world-class player on the cheap with these Football Manager 2018 bargains. After future prospects? 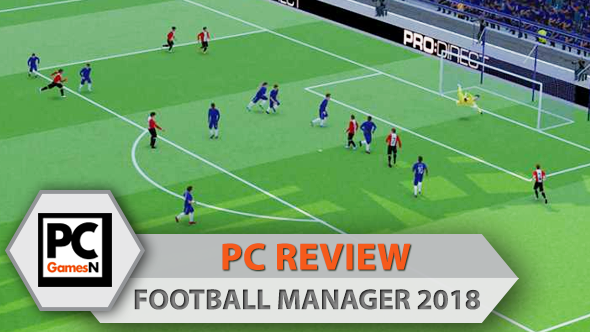 Check out our guide to the best Football Manager 2018 wonderkids. 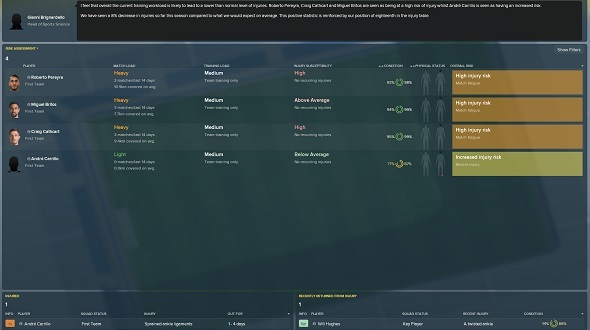 Don’t blow your budget with the best Football Manager 2018 free agents. 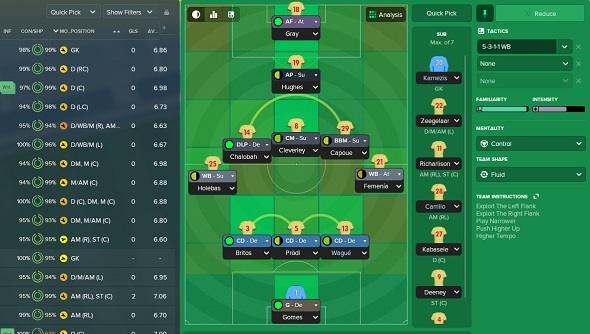 Get to grips with the new features with our guide to Football Manager 2018 tactics. That is it, then. All change. Roberto Firmino off, Dominic Solanke on. Mo Salah has had his chance, James Milner is having his. If the flair players cannot do it then the blunt ones will. Here we go: an 87th minute cross from Milner lands on the head of Solanke. Goal! St. James’ Park is silenced. 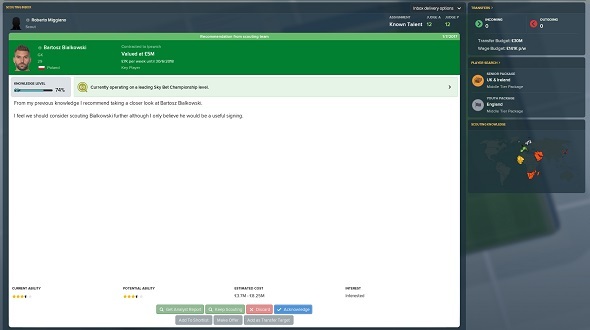 Second guessing yourself has forever been part and parcel of the Football Manager experience and this 2018 edition is no different. The level of complexity on offer here means that best laid plans are rife for going over again and again until you have forgotten what the original idea was. Combing over the post-game statistics and replays can be as detrimental to future success as it is helpful. Quality data analysis is one part data acquisition, one part data reading. The game does the first bit for you, but you have got to do the harder, second part. Read the wrong thing from the right info and you are on your way to getting sacked.In this regard, there are some that have forever seen the Football Manager series as too cold and mathematical – a representation of the beautiful game that only the math quants of Wall Street could truly love. This is a false reading, not least evidenced by my long-term tenderness for the game despite my A-level Maths results. Nonetheless, developers Sports Interactive have worked this year to provide a greater quantity and quality of narrative footholds to help you navigate the underlying wall of numbers. Squad Dynamics is the most meaningful of these, a system that allows player personalities to play a bigger role in proceedings. The idea behind Dynamics is to link the emotional state of players to their performances. 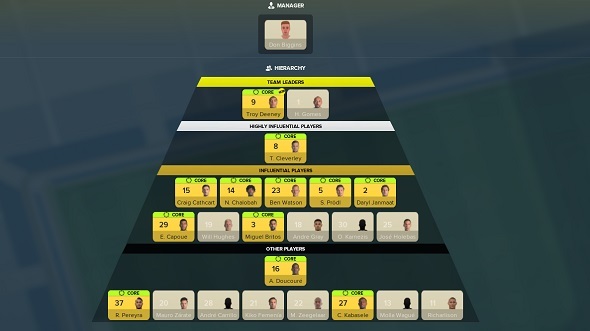 If you manage the squad poorly and create enemies then performances will suffer, as they will if squad mates hate each other or let rivalries get out of hand.New menu screens depict the hierarchy of your team by splitting it into a pyramid with ‘Team Leaders’ at the top and working its way down to the least influential players at the bottom. Ideally, you do not want too many highly influential players in one team, as these can cause disharmony as everyone vies for their status to be recognised and celebrated on an individual basis. If you do piss off someone of influence then that could have a negative impact on the social group they belong to, although you need to weigh up the cons of doing so with the pros of looking like a commanding force in the dressing room. The end result of Dynamics is that it forces you to think about football in a more rounded way, rather than just the analytical components of tactics, training, and transfers.Is it really a good idea to bring Zlatan into a dressing room already containing Ronaldo and Sergio Ramos? Lorenzo Insigne’s performance has not impressed you, the manager of Napoli, but can you afford to handle the fallout involved in dropping him? Indeed, Napoli is a good example of how a successful approach to Dynamics can reap huge rewards for your team. Players who build up strong relationships with one another see a return on the pitch in the form of improved cohesion. This can be vital if you are seeking to play the kind of intricate passing game that Napoli’s team is capable of. Better cohesion means they work better as a team, which can be enough to overcome an opposition featuring better talent, so long as you manage to align all of your pieces just right. 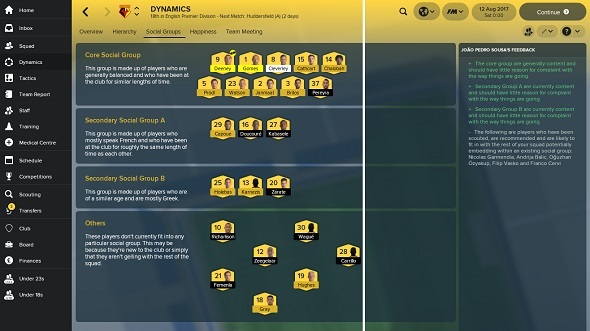 Dynamics, without question, is one of the most game-changing elements that Football Manager has seen for a number of years, and it demands just as much effort and attention as the most familiar pillars of the series’ design. Players now feel like humans rather than inanimate chess pieces and that works to draw you deeper into the simulation than ever before. Elsewhere, welcome changes have been made to tactics and player recruitment. The tactics screens offer a far greater range of analysis options that allow you to quickly see where you team is strong and weak – both in terms of their overall characteristics and how they are performing in specific areas of the pitch. A grid overlay can be projected onto the tactical pitch view, for example, with each coloured shaded in green or red to various intensities. The more green the square the more presence your team has in that area, whilst red means you are lacking.How you use this information is up to you, of course. You might be intentionally leaving an area evacuated in order to overload somewhere else, although if that’s the case you had better beverysure that what you are doing is working. Recruitment has been influenced by the real-world shenanigans involving the mega-fees for the likes of Neymar and Kylian Mbappe. Clubs want astronomical fees for some players and seem to be more keenly aware of your financial status when coming back with an acceptable price. If you are playing as a Premier League club then beware: the rest of the world knows you have got a lot of money to spend.Combine this with altered ways to split the fee you are paying into variously staggered instalments of different amounts (in order to avoid falling foul of financial fair play regulations) and you have a lot to think about in comparison to previous years. In general, what all of this adds up to is a more sensitive game. All of the depth is there as before, but the humanity of football is represented in a greater way – whether that is through players striking up bromances that lead to goals on the pitch or you personally getting involved in pricing wars with clubs from Europe and, increasingly, China. Yes, this means there is even more to think about and, yes, it is more complicated to get your head around at first. Ultimately, though, Football Manager 2018’s smattering of statistics make more sense than before, because you are more able to employ your emotional intelligence as opposed to relying solely on more rigid interpretations of intellect. By the way, I got fired as the Liverpool manager after getting beaten by Sevilla in the first knockout round of the Champions League.